Open new Google Docs with shortcut URL, Stress Emphasis using em, Chrome Extensions for Growth, Free Landing Page Templates, Check URL Social Shares, Stylish Login Box, 3D Facebook Photos. A surprise that helps in your productivity is a smart surprise. 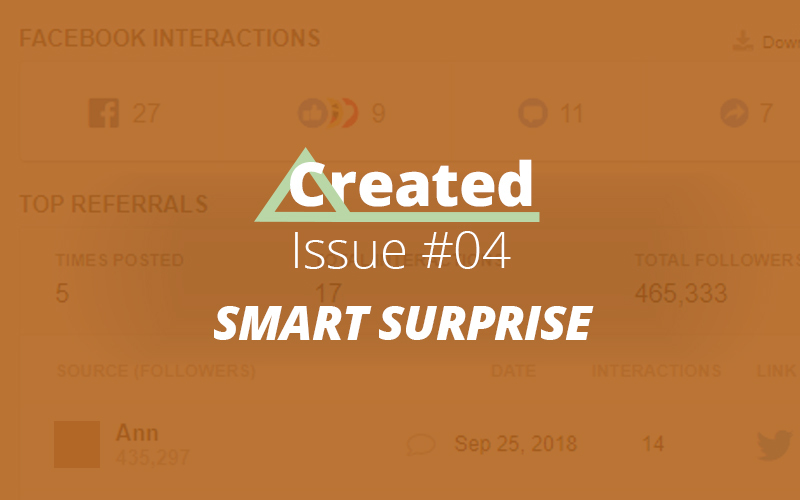 So, typing doc.new automatically triggers a new Google Doc file, a click of a button show who shared your website on Facebook, Twitter and many more surprises in this edition of “Created”. 2. Using em for italics… is so common. In HTML5, em is not for emphasis but is for stress emphasis. Confused? Facundo Corradini explains this beautifully with examples. 3. Free Chrome Extensions… for ultimate growth in searching right keywords and leads. Check this list featuring a lot of useful Chrome extensions that might become permanent in your Chrome browser. 4. Free cool templates… does not hurt anyone, right? Check out cool free HTML landing page templates for startups on this website. 1. Astra now Gutenberg… compatible WordPress theme, which releases in WP 5.0 version. Read here to find out what makes Astra theme Gutenberg compatible. 2. Elementor is shinning… with all new design of their official website. For starters, Elementor is on the most popular page builder plugin for WordPress users. 3. Style login page… easily with new Easy Login WP plugin by Jeffrey Carandang. It comes with 10+ pre-built theme styles for the amazing looking login page. 4. Cool Photo Gallery… like Masonry, Fullscreen Stacked and Carousel Slider look in Gutenberg blocks. Check the Block Gallery plugin for quick implementation. 1. Music in Facebook… stories when posting photos and videos on Facebook. Well, Facebook just added music selection for easy audio goodness to your visuals. 2. Up to 6 people can… video chat on Instagram Direct now. Here is how 6 people video chatting on mobile via Instagram would look, looking beyond photos? 3. Cool looking 3D photos… swamping your Facebook timeline? Here is the mystery behind how these 3D photos become 3D in the Facebook land. Until the next time… hope these smart surprises were smart enough!